One of the relatively less-discussed topics on personal finance is how to prioritize savings goals. In management colleges and the corporate world , an often discussed term is setting SMART goals. Specific, Measurable, Attainable, Relevant and Time-bound. 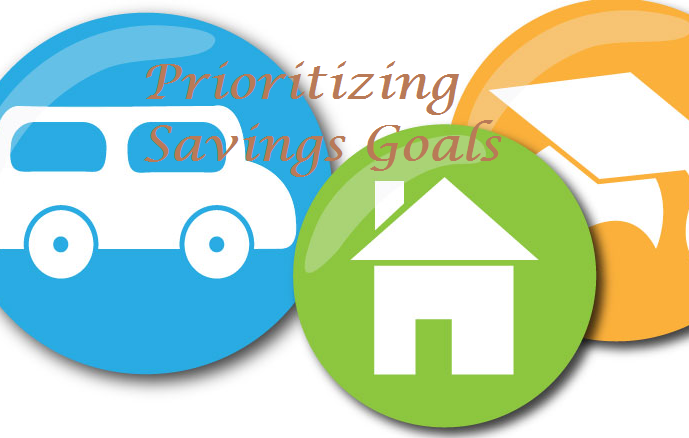 Our savings goals also need to follow the SMART criteria. Ask yourself honestly – how many of you have savings goals set? As I often mention, blogging is one of the ways I hope to have better control of my own finances. I decided to write an article on setting investment goals while actually setting my own goals in the process. At any point, we have many financial goals to achieve: paying off debt, saving for retirement, saving for rental properties for Passive income, saving for our child’s education, buying home, buying a car in next 5 years, taking a dream vacation in Europe, and probably a thousand more. I assume that you haven’t achieved many of the above goals yet. so the article might actually help you more than what I intended while writing. We are a single income household, and we’re renting while saving for the down payment towards our new home. As I am saving for various goals at the same time and, until recently, I had no clue how to prioritize one goal above the other. After hours of research I now realized that there’s no right or wrong way of prioritizing, as long as you’re saving according to your plan and saving enough. This is what is my first take; emergency fund is the first one you should aim for. Don’t save a cent for something else, or pay down any other debt, until you have at least $1000 saved for emergencies. Following that, you should build up 3-6 months of expenses toward emergencies while doing everything else like debt repayment, etc. The ideal size of an emergency fund is debatable. Regardless of your financial situation, this has to be the highest priority in your savings goals. Only retirement savings qualify as long-term saving goal. I believe you should consider saving for retirement your next priority. Choose a contribution amount and save every paycheck without fail. One good way is to straightaway set aside 15% of your income into a 401(k), IRA, or Roth IRA account via automatic deduction from your checking account. With the Social Security fund situation, if you haven’t reached forties yet, you are unlikely to receive the payout our parents or grandparents receive (or once received). We have to bear most of the burden for living expenses in our retirement ourselves. If you don’t make retirement savings your number 2 priority, you’ll be left with three options: retire late, lead a lifestyle of poverty, or work even in very old age. However, personal priorities are important and could trump retirement savings, but we believe you should consider contributing at least enough to your workplace savings plan to maximize any match. It is important to understand the impact this has to your retirement goals and begin additional retirement savings as soon as possible. For me, this includes buying a home, a new car, traveling around the world, and building a college education fund for my children. Prioritize within the category and focus on one goal at a time. If you have debt, than debt repayment should take priority in the list of medium term goals. Dave Ramsey’s debt snowball is something you can look into for debt payment strategy assistance. Start repaying debt only when you have built a sufficient emergency fund and are depositing money regularly into retirement savings. Depending on the rate of interest your debt incurs, you can give debt repayment a priority over saving for long-term goals. A repayment of credit card loan that charges 10% interest should always be a first priority among medium term goals compared to earning 3% interest in saving bond or funds which you set aside for your mortgage or car payment. I do have a few short-term goals but they are my last priority. Since my longer term and medium term goals are not yet achieved, I don’t want to derail them by putting savings aside for short-term goals. Car maintenance, home improvement, or setting up a home theater are examples of short-term goals. I am setting up a fund for opportunity costs, which could include childbirth/adoption, helping a close family member in need, taking a training course, etc. The latest use of the fund was to buy a new laptop computer. For the rich, this is the topmost priority. You know why? Because they’ve already met the rest of the goals. You can put additional money aside to invest in a business venture or in the stock market. It is one thing to set up goals, and another to stick to the plan. If you aren’t disciplined, your priorities could be a victim of your own impulses. We need to master the ability to delay gratification. which means resisting short-term pleasures in favor of long-term happiness. If you can’t save for short-term goals, you won’t be able to keep money aside for more important long or medium term goals. What are your saving goals and how far you are readers? Having a financial map is always a great idea, no matter how long it took to realize you needed one. The most important thing you said, in my view is “There’s no right or wrong way of prioritizing, as long as you’re saving according to your plan.” No two people are in the exact same situation, so what works for one won’t necessarily work for another. So, just by having a plan and following it, a person has already taken the biggest step. The rest is an excellent guide, and you certainly took a long look at what you need to do. Prioritizing your financial priorities! I love it! how do you do it MC? I am a fan of SMART goals. I have 3 long term goals. But I do shuffle them all and prioritize. Not all my long/medium term goals get prioritized over short term. As you said, each of us are different. As long as we have a plan we are good I guess. That’s interesting, and looking forward to hear what short term goals are taking priority over long and medium. Definitely your plan doing good I guess. How much emergency cash you generally carry? If it’s too much you can think about tiered CD approach as well. I like to have about 9 months in emergency cash. As a last resort, I also have plenty in my 401k for an emergency loan. In my line of work it’s possible to have a bad year, not just a bad month. I haven’t ever used a tiered CD approach. I do understand how it works, but I prefer bond ETFs for a little more oomph. that’s good approach, now let me put some effort to under stand the oomph factor and the differentiator between the two. I can make it to a post altogether once i am done. I made savings a priority and set up a payroll deduction to max out my 403B, IRA and Roth IRA and live on what is left. Looks like your step 1 and step 2 are going as per plan. Payroll deduction is nothing but prioritizing the saving..great! I’ve been struggling with this very thing lately. There are several projects we’d like to save for and several larger items as well. We also know we’ll need to buy a car sometime in the next couple of years. Lately, I’ve been somewhat haphazard with my savings for these things, but I like the idea of making a list and then prioritizing it. Simple, but smart. Welcome back! You can make a list as per the goal horizon, take a piece of paper and things should be easier going forward. Great tips! Step 5 seems to be the natural progession after the others, as long as you can stick with it. I love that you mentioned SMART. It is something that many people feel is unnecessary, but is critical to actually accomplishing goals. Many times failure to meet a goal is related to poor goal setting. Somewhere along the path of growing up into adults, I think all of us who have had otherwise healthy upbringing for the lessons of financial discipline. Much of the advice being put out today is stuff we have grown up hearing, but failed to put into practice. Setting goals and prioritizing them has helped me overcome a series of personal financial debacles in the recent past. Reading this post reinforced my commitment to use this strategy to deal with what life sends our way. Thanks a lot. Dhonyobaad! This was a reflection of what I was taught in my childhood. Glad you liked it! For me this post lacks any realy content. Sure, make your goals smart. But you don’t give an example. You say you prioritize on time, but I’m sure that’s not true. Because if you did you wouldn’t get out of the retirement saving, and on to other things until you’re 40 or even 50. So you still save on various different goals at the same time. So how do you pick how much to spend on each? There’s no answer on that question in your post, although that’s the main questions. A possible way to do this is to list your various saving goals and make them SMART as you said. For example, I want to go on holiday in June 2013 to [insert place] and I need a budget of 2500 dollars. (this is just an example). This means I need to save (2500/18 months =) 140 dollars per month. From this I get a list of saving wants on a monthly basis. Quite likely I’ll want to save more than I can. So I order this list in order of importance to me. As you can see the total is 1330, 330 more than I can save. But since I put them in order of importance I can see where my savings go. At the moment I’ll not be saving for Art or that Home cinema set, because the other stuff is more important. It’s a bit like the debt snowball, because you first save for the important stuff, rather than for everything, you can after you’ve reached that goal save more towards your other goals. The order of the list is determined by you and you alone. Although I agree, EF & retirement should be on top of the list somewhere. Exactly sums up my disapointment after reading this post! Great example of a possible solution. You should write a blog, i’d read it! I disagree that saving for retirement is a person’s only long-term goal. I look at long-term goals as anything I will save for for more than 10 years. So, saving for my kids’ college and a bigger home are long-term goals for me.